Cop Block & Fully Informed Jury Association Billboards Going Up in Richmond! RICHMOND, Virginia- On January 18th, 2012, two billboards with ads promoting police accountability and Jury Nullification will be displayed in the Richmond area. The initiative is being headed by Nathan Cox, an Army Veteran and activist for the cause of Liberty, during the week of MLK’s birthday. Dr. King understood well that just because one be in a position of power, doesn’t mean that person will act in a moral way. Two organizations that advocate justice and liberty are being promoted by Nathan Cox, who believes that people have the right to be treated fairly and equally by all, whether you wear a badge or a robe. The second organization Mr. Cox would like to promote is FIJA (fija.org), or the Fully Informed Jury Association. FIJA is a non profit organization whose goal it is to inform citizens of their rights as a juror and that the juror’s mission should be to “protect fellow citizens from tyrannical abuses of power of government.” It has become the belief that the juror’s sole duty is to help decide the innocence or guilt of a fellow citizen as well as pass down punishment upon them. Jury nullification is one right of a juror that FIJA teaches about. The founders thought it was important for the people to have a counter to bad laws and practices, so made it possible for a jury to acquit defendants who are technically guilty. An example of how jury nullification works is during the time of slavery. Some jurors would refuse to convict people who were supposedly guilty of helping to free a slave. Slavery is immoral and therefore the people felt they needed to use jury nullification to work toward justice for slaves and those who helped them. Nathan Cox served his country in the military because he [initially] felt it was his duty to fight for liberty abroad, yet soon realized the greatest enemy to liberty is right here within our own borders. He now works as an activist informing others of the aforementioned organizations and issues because he feels that is his duty as well as to fight for liberty right here at home. Please find out more information at the websites provided or contact Mr. Cox if you have questions, would like to find out how you can get involved, or care to donate to the cause of liberty. 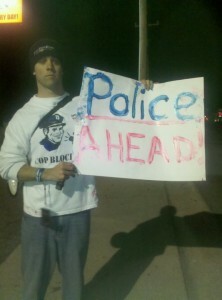 Help Nathan introduce Cop Block and FIJA to tens of thousands of people. Replicate it in your area. I’m sure Nathan would love to share the process of how he made this happen.